Its hard to tell who enjoys the Friends of the Library Daycare Reading Program more, our volunteer readers or the children enraptured by the stories. 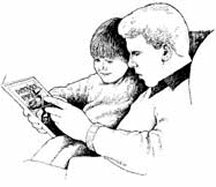 The mission of our visits is to promote the fun of reading in the preschool children of Boone County and to encourage our wee ones to ask their parents and caregivers to read to them. At the same time our readers also invite our newest generation to visit the Boone County Library with their families and take its wonderful stories and adventures home to enjoy. Each prospective reader is partnered with a preschool or daycare center in Boone County and a once monthly day and time is agreed upon. Shortly prior to the reading the volunteer reader visits the Boone County Library and selects an age appropriate assortment of books from a Friends of the Library collection located in the childrens department on the second floor. The reader chooses approximately 3 to 5 books to read plus enough additional books for each of the children to read to themselves after the reading. Normally we read as long as the stories hold the childrens attention, anywhere between 15 and 45 minutes. The extra books are then handed out and the children read their own book for about 10 or 15 minutes. The reader then collects, counts and returns the books to the library at the earliest convenience. Excluding the trips to and from the library, the whole reading takes less than an hour per month. 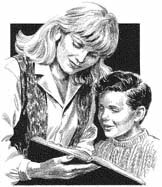 If you are interested in learning more about our reading program, or would like to join our group of readers, please contact the FOL at "fol at folbc dot org" (changing the "at" to "@" and the "dot" to ". ").